When God takes something from your grasp, He’s not punishing you, but merely opening your hands to receive something better. Concentrate on this sentence… ‘The will of God will never take you where the Grace of God will not protect you.’ Something good will happen to you today; something that you have been waiting to hear. I was just sent this in an email today and it fits so well into my life right now. I have been wondering which direction I should be going and some days feel like I am going backwards. I have been struggling to find the direction that I am meant to follow and have been floundering a bit. Maybe this was my ‘sign’ to follow. This past week I have been deciding which way my blog should go. I knew I wanted to share my journey, but have been struggling with the thought – “why would anyone care”. I don’t have anything profound to share that isn’t already being blogged about, but there is still the feeling that it is the right thing to do. I read so many other blogs and am truly inspired by everyone out there. Well, I have been listening and am going to follow that not-so-silent voice in my head and move forward. I discovered after trying to insert something onto my current blog and it wasn’t working I would have to switch my blog over to a new site – OK, now how do I do that? This was my first thought, so I started searching and of course everything I found costs more that my non-existent finances could afford. Well, whether it was fate or that ever so powerful guiding hand, I am being led in the direction I need to go. (I might even be able to generate a tiny amount of income from my new site!) This is something I knew nothing about 7 months ago when I started this. ‘To get something you never had, you have to do something you never did.’ I can definitely say I am doing something I’ve never done before! I am excited to move forward and hope that in some small way I can inspire others to trust and follow where HE is leading us all. I am so excited about my vegetable garden this year. This may sound lame, but it has not been a pretty site for the last two years. We have been in the midst of remodeling our home and this has been a slow journey to say the least. We have added nearly 1400 sq feet to the back of our house and this meant digging out a mountain of dirt for the foundation. Needless to say, we still have that mountain in what used to be my large garden area. Last year we rushed to try to get a garden area ready and I planted probably 2 weeks later than I normally do (I try to have everything planted by Memorial weekend), and I was in too much of a hurry and did not prep the soil properly. Well, it was pretty much a failure as far as gardens grow and I only got some green onions, a few beets, and lots of green tomatoes. 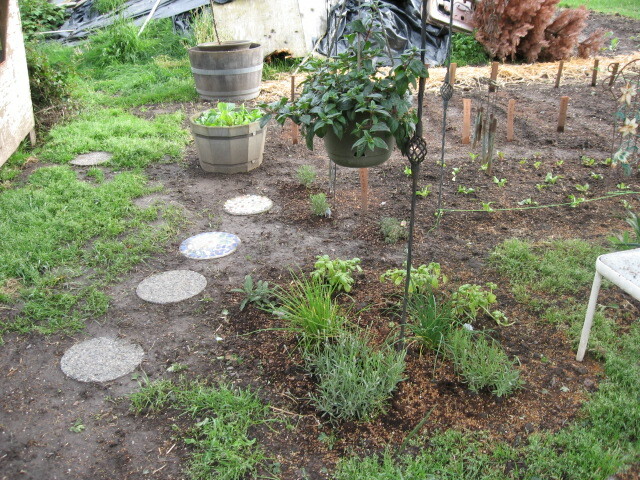 So on to this year…..I still have the mountain of dirt, but a much better prepped garden area. This past weekend we had beautiful weather, mid-70’s, so it was the perfect time to plant. I started the weekend, well Friday anyway, going to a bi-annual wholesale plant sale at a local nursery. This didn’t have anything to do with the vegetable garden, but I love plants too! I am ever so slowly trying to landscape our yard (it isn’t very pretty right now…..the remodel and all) so I am taking advantage of the super plant deals during these sales. 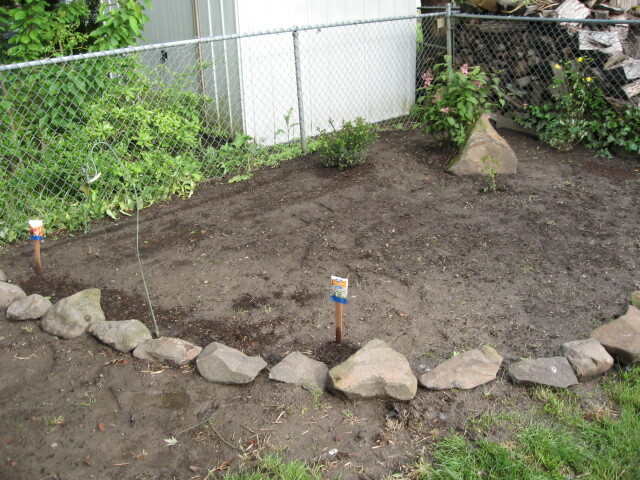 I got a beautiful rose bush, a dark pink lilac, a holly bush, and 3 Hostas. Seven tomato plants. I am using the red plastic as it is suppose to improve the tomato harvest and after last years dismal results I will try anything. The straw areas you see are covering the potatoes. I have never planted potatoes before and heard they are easy, so we’ll see. 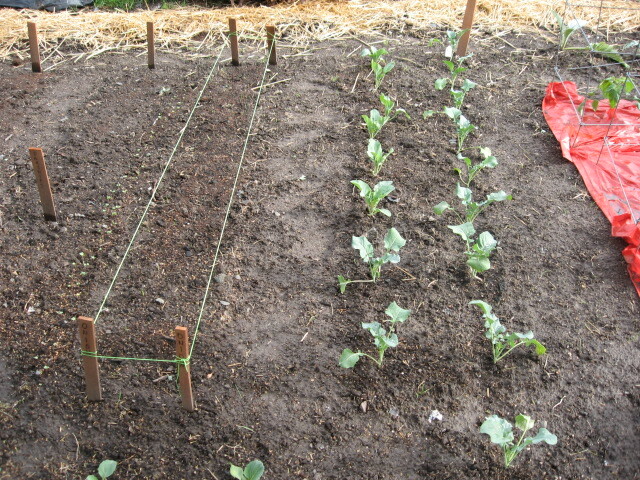 Broccoli and Cabbage – I need to add more broccoli so I have enough to freeze for later in the winter. 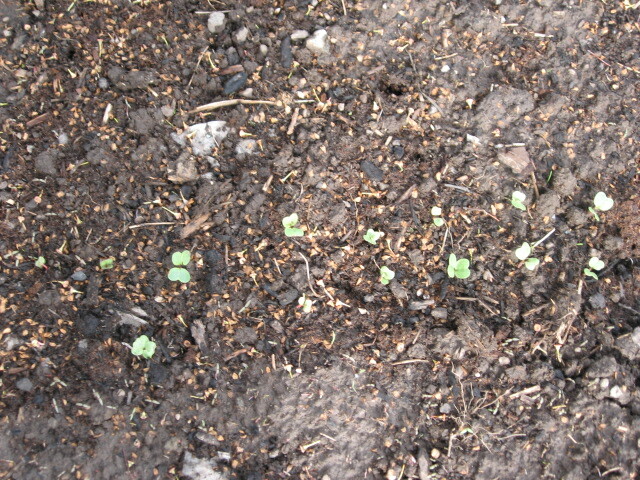 Radishes, already peeking through the soil! 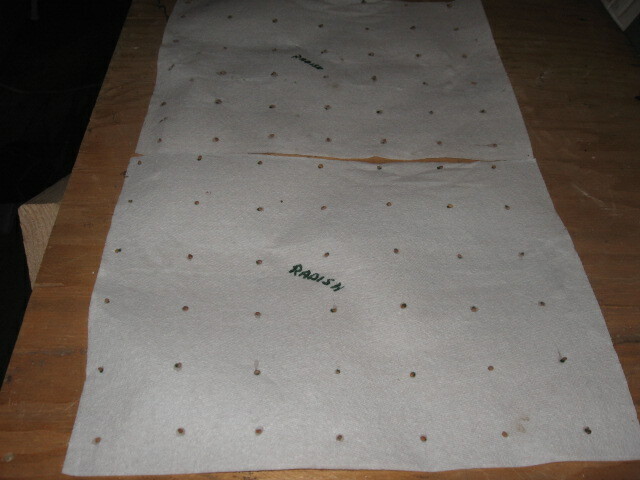 I started these seeds on paper towels, evenly spaced. This is the first time I have tried this method and at least so far the radishes are growing. I also did the paper towel method with my parsnips, beets, carrots and dill. It is a bit too early to tell if they are working or not. pickling cukes along the fence to use as a trellis, dill in front of the cucumbers, chamomile seeds behind the rocks along with my new lilac and holly bush! 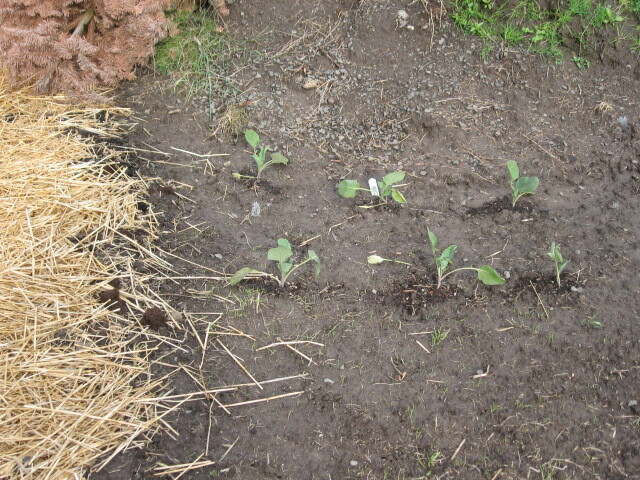 I didn’t get the zucchini, acorn squash or pumpkins planted though. I worked so hard for three days and looking at it now it sure doesn’t seem like a lot. After such a beautiful weekend we had thunderstorms, high winds and torrential downpours. The temperatures dropped and I had to cover all the tomatoes with buckets to protect them. Maybe planting earlier isn’t better?